It’s more a treasure hunt list than anything else. They’ll only be gone two nights. Yet here I have a closely typed A4 page of essentials to be packed if you don’t want your daughter to die of exposure. They’ll be staying in a cabin one night and a tent very close to the cabin the next, but that hasn’t stopped a whole group of parents with only one overprotected daughter being convinced that they’ll be eaten by bears. Or worse, get all muddy. 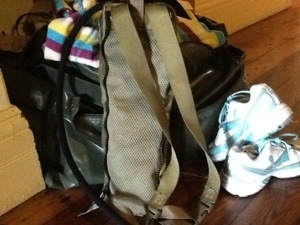 Muffet has a father who has actually been to war, so is very excited to be packing some of his Army kit. The sleeping bag, the camelback water pack, the sleeping mat, the giant waterproof bag are all khaki. Also one of those shawl arrangements that men in Afghanistan wear over their heads when caught in a sandstorm, you never can be too prepared. But what child of twelve whose feet are going up a size every six months has more than one pair of sneakers? I can’t buy the ones in Kmart for four dollars, they may well dissolve if they get wet. It’s Volleys from Target for the spare set of shoes in the pack. I wasn’t planning to get her new track suit pants until winter, so she’s also going to have to put up with ones from Target as well rather than the velour ones I was going to have to go on a quest to find. Thermal underwear, oh come on. Next. Torch, I’m sure we have one somewhere, I may have to pay the Horror two dollars to find one for me. Plastic plate, bowl and etcetera, we definitely have a picnic set somewhere that someone gave us for Christmas about ten years ago, or possibly as a wedding present. Two fleece jumpers, no way. I did go up to the Kathmandu outlet store to get her a zip up fleece jacket that is so bright that she may not need that torch, but I wasn’t buying two. She won’t wear jumpers, none of my kids like pulling them over their enormous heads. She’ll have to pack a track suit top or something. I thought we had everything covered until she tells me this afternoon that she needs mid length shorts for wearing under a harness. I suggested she borrow a pair of the Horror’s, they’re a similar size. Her reaction indicated that she may have misheard me and that she thought I suggested she actually eat his shorts. We may have to do some work there this afternoon, there’s no way I’m going back out to the shops. Undies, sunscreen, insect repellent, framed photograph of her brothers, all checked. We’re nearly ready for camp.